19 September 2012 – The Rolex One to Watch for September 2012 is awarded to Alexandr Belekhov (RUS), who is currently based at the St Petersburg Horse Club (RUS). During the month of August, the 40-year-old jumped from 418th to 224th – a move up the Rolex Rankings of 194 places. Belekhov, who started to ride when he was 10 years old, spent much of his early career training in St Petersburg, where he was also born and raised. Belekhov’s first trainer was Larisa Tciganova, and throughout his career he has been trained by Nikolay Lekkin, Viktoriya Romanova, Viktor Romanov and Igor Samodurovskiy. Belekhov’s career highlights include winning an International 3* horse show in Moscow (RUS) in 2007, and also being crowned Russian champion at numerous indoor and outdoor shows. Belekhov most admires the German Show Jumper, Marcus Ehning, and his dream is to one day represent Russia at the Olympic Games. On his recent performance at the CSIO5* Bitsa, Moscow (RUS), Belekhov finished in third place in the 1.60m Grand Prix riding his bay gelding, Sancho Pansa. Belekhov and bay gelding, Liding Light, also went clear on day two of the competition to win the 1.50m Big Round class against the clock, and the pair recorded a second place finish in the jump-off in the 1.50m Big Round class on the opening day. The Rolex One to Watch is an initiative which identifies the rider who has made the biggest jump within or into the Top 250 of the Rolex Rankings the previous month. October’s Rolex One to Watch will be announced at the beginning of October 2012. For details online featuring the Rolex Rankings please click here. • Rolf-Goran Bengtsson (SWE) is currently ranked number one in the Rolex Rankings and therefore holds the Green & Gold armband which bears the words “Number 1, Rolex Rankings”. 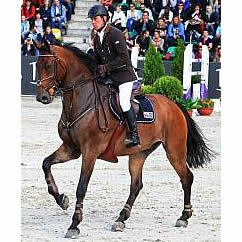 • Rolf-Goran Bengtsson shall wear it in all competitions whilst he is the Number 1 ranked rider in the Rolex Rankings. • The Rolex Rankings are the only official guide to excellence in Jumping recognised by the FEI, and the Green & Gold has been devised for equestrian fans at events, and for those watching on TV internationally, to instantly recognise the world’s best/leading rider. • The Rolex Rankings are updated monthly and issued at the start of each calendar month. For more information on the Rolex Rankings and to download the latest standings please visit the Jumping section of the FEI website at www.fei.org.